When it comes to going social, some of the best and brightest pioneers are restaurants. The sharing-driven nature of social media mixes well with the visual world of the restaurant industry. We’ve all seen people snapping photos of their dish to share on Facebook (and maybe indulged once or twice ourselves). In fact, there’s a dizzying array of ways that consumers can interact with and endorse restaurants on social media, including check-ins, photos, recommendations, tips, lists, and much more. So really, the question at this point is why wouldn’t a restaurant be using social media to help them achieve their business goals? And yet, there are some pretty great businesses that would do well to use social media that are not seizing the opportunity. Today, we’re going to go over those opportunities using two businesses that haven’t really made the jump as our examples. The restaurants we’ll be examining today are Wings Over and Kings Family Restaurants. Wings Over is a group of franchises born out of Massachusetts, specializing in delivering hot and tasty wings made fresh (I used to be a delivery driver for them – try the boneless Honey BBQ, you WILL thank me). Kings Family Restaurant is a chain of American-style dine-in restaurants with a history starting in the Pittsburgh area. Both of these chains have dipped their toes, in one way or another, into the social sphere, but neither is really jumping in the way that they should be. Let’s take a look at what they’re missing. Social media provides many channels through which a restaurant can garner reviews. For instance, Foursquare has Tips that users can leave, Facebook has Recommendations, and of course sites like Yelp and Google+ Local are completely built around the review mechanism. Frequently, marketers like to point out that these systems give restaurants the ability to both remedy any problems with customers and get their side of the story out for everyone to see. Seeing as conventional wisdom holds that finding a new customer is as much as ten times more expensive than keeping one, this sounds like a remarkably cheap way a business can prevent customer loss. However, there is a more tangible benefit to businesses beyond that. A recent study by two prominent Berkeley economists discovered that as little as a half-star difference in a restaurant’s Yelp score would swing their business up by about 27%. In the restaurant industry, where margins are often very tight, this could mean making or breaking a new location. By taking the right steps to get customers to review the site, a restaurant could see a nice return on their investment. Social sites also aid in ensuring that your restaurant shows up when someone is using what’s called a ‘branded search’, like ‘Wings Over Evanston’ or ‘Kings North Versailles’. For example, let’s see what comes up when we search for ‘Kings Monroeville’. What we find is that a TripAdvisor.com page is the top result. Additionally, it has a 5-star rating underneath the page title, making that result stand out on the page. This is not ideal for Kings, as the top result routinely receives the most traffic. This robs Kings of the opportunity to interact with that visitor and get them to convert on one or more goals. For example, if a customer interested in rewards programs lands on the TripAdvisor page, that customer will not see Royal Rewards section of the Kings Site, which they probably would have converted for. A simple check of their analytics would probably reveal a discrepancy between visitors who visit the Royal Rewards page from the Monroeville search versus those who land on the site from higher-ranking location searches. Since rewards programs can be a big driver of repeat business for restaurants, Kings is actively losing money in this example because of the discrepancy. Social media can help resolve this in several ways. As part of a larger content strategy, social media can serve as a channel to help spread content optimized to improve the rankings of pages for branded searches. This leads to more people linking to that content and social signals being attributed to it. Those links and signals help that page rank in the number one spot when someone is searching for the terms that content is optimized for. Social media can also provide the same kind of rich snippet oomph that the TripAdvisor link enjoys. 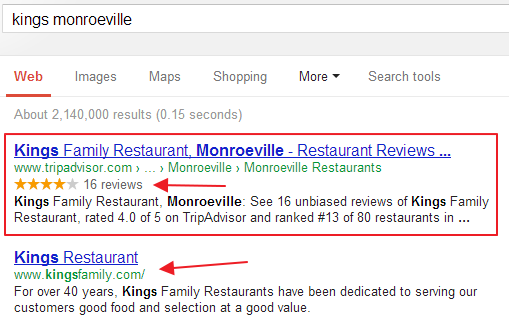 By linking pages with Google+ Local profiles, pages enjoy a large amount of rich information on branded searches. Take a look at what comes up when we search for Wings Over Evanston. As you can see, the results show the aggregate reviews they’ve received from Google users, as well as a large knowledge graph section on the right hand side of the page with a map, at-a-glance information, and more. This makes the result much more attractive – rich snippets increase click through rates of pages as much as 30%, a huge boon. Coupled with the revenue boost that from positive reviews garnered on social sites, these little changes make a huge difference in a restaurants bottom line. Another tangible way social sites help with a restaurants bottom line is by increasing the likelihood they’ll appear in non-branded searches. A non-branded search is something like ‘Boneless wings State College’ or ‘Diners Robinson Township’. It does this by functioning as part of a larger content strategy, just like with branded searches. A company will create content that is optimized for non-branded keywords they wish to rank well for, then use social networks to share and facilitate the spread of that content. This, in turn garners social signals and additional links to the content, if properly positioned and created. Likewise, this helps to move the page up the rankings, driving more traffic. That traffic can then be called to join their social sites, creating a positive feedback loop for the restaurant. Social signals are the interactions a particular page or piece of content on receives on social networks. We’ve heard twice now from Matt Cutts those social signals are playing a role in determining the results of a search query. Currently, I would guess that effect is pretty minor. We have only really seen correlation studies thus far, and the most thorough attempt at a causal study that I’ve seen only concluded that they might not be, an indefinite answer. However, we can be reasonably confident that social signals will yet play some role in the results going forward. Having active social presences to help propagate content and creating pages that will accrue authority on the various social graphs now is a smart move. Additionally, social media is not going to go away; it will only become more prevalent. It’s better for a business to get in as soon as possible and find what works for them early, than to try and play catch up later on – like some businesses who ignored their search efforts or even the internet altogether. The last way that social sites can increase the business that your restaurant receives is through social discovery. Social sites like Foursquare or Urbanspoon have core components that help their users discover restaurants they might like. These choices are influenced by user reviews and activity the restaurant receives on those networks. By increasing the likelihood someone will interact with your business in that way, a restaurant will see more business. Beyond social discovery tools, restaurants can increase awareness of their business through interacting on social sites. User interaction on social sites appears in the feeds of those users friends, creating a ripple effect for a restaurants awareness or content. Likewise, responding to those comments increases the likelihood of exposure for a restaurant on a social site. So, in review, there’s plenty of ways that restaurants benefit from social media programs. Reviews have a direct and causal relationship to driving increased business, with a half-star on Yelp being estimated to swing a 27% increase in diners. Social sites can enhance those reviews, provide a platform to save potential lost customers, and can put those glowing reviews directly into the search results and drive diners to click on your site. They can also assist in other programs designed to increase your restaurants visibility in branded and non-branded searches. And finally, they can lead to your restaurant receiving new business through social discovery tools like Foursquare. It’s worth pointing out that all of these benefits are additional to the effects social tie-ins can help on your on-going marketing efforts, including increasing repeat customers and increasing things like Top of Mind Awareness, among others. And best, these are almost entirely measurable effects – no marketing voodoo required.